Meandering through the neighborhood of Chelsea a few months ago, I came across a plaque fixed to a townhouse at 337 West 20th Street (between 9th and 10th Aves) that revealed I’d inadvertently stumbled upon morning muffin holy ground. The plaque commemorates the location of what is now called the”Muffin House” (a duplex unit inside was recently listed for $1.1million…or ~950K muffins at today’s dollar/muffin exchange rate). 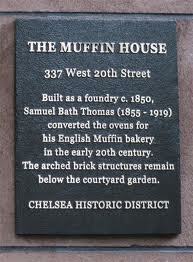 In the early 1890s, Muffin House served as the second of two bakeries run by Samuel Bath Thomas (his first bakery was around the corner at 163 Ninth Avenue) who, after arriving in 1874 from England with the dream of bringing his secret recipe to the masses, had quickly made that a reality. Yet although these muffins have been baked on domestic soil for well over a century, I’ve found no records that Sam ever considered amending their name. 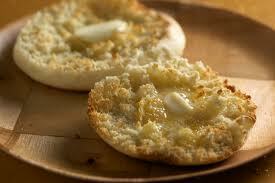 Next time you’re in the area, whip out a TEM and toast where it all began.